This past weekend, my aunt came to visit us from Chico. Though it was not her first time in the Bay Area, we wanted to take her for some sightseeing. We hadn't decided where to go until we were already in the car and up on the ramp to I-880. Min asked again - so where are we going? When we were up on the ramp and on the highway, the skyline of San Francisco across the bay came into sight before us. As spontaneously as we plan things, few minutes later we crossed the Bay Bridge and took the downtown exit. As we were about to cruise through the downtown, Min asked with a smile if we want to have cream puffs. Then I remembered there is one Beard Papa store in SF downtown. When Min and I were living in New York, we often stopped by Beard Papa (on Broadway and 84th in Upper West Side) on our way back from grocery shopping in Fairway a few blocks down. 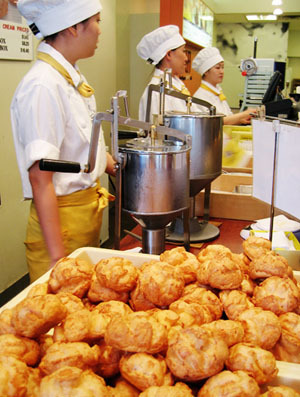 They sell the freshest, giant vanilla cream puffs and also offer daily special flavors. We'd order one regular and one daily special and finish them on the spot. Since we left New York last fall, we haven't had their cream puffs for the longest time. So, when Min mentioned Beard Papa, it took me back in time and place when we were dating in New York, and spending much time and money pigging out on foods like pizza, sweets and finger foods. Sometimes it's overwhelming to think that all the changes in our lives (getting engaged, moving back from the East coast, getting married, and finally settling down in the Bay Area) took place within just past year... Like Min, the cream puffs make me smile, too. It may be because we are still "newly wed" after all, for we tend to attribute sentimental values to everything we do and stuff we eat :) I wish that we continue to enjoy Beard Papa's cream puffs with the same smile and excitement like today again and again in our years to come. In our era, Louis Vuitton handbags became renowned and reckoned in numerous countries around the world. Descends from France, the designer "Louis Vuitton" includes a large base of clientele. Apart from handbags, he manufactures other products and fulfill customer demands and necessities like Louis Vuitton shoes. From the whole world, Louis Vuitton has gained immense popularity and fame. Designer Chanel handbags with bright accessories are necessary for females to all seasons, particularly in summer. Get a handbag, hobo handbag, or any other variety of handbags you serve them with the site is always authentic.Olympia Satchel - This handbag is transportable, huge, yet not overlarge. It attributes the best quality natural leather and inside coating, go openings, best freezer closure, returning retaining wall freezer pocket and dual connectors. It's just a high quality handbag inside the very reasonably priced value.designer Chanel replica handbags for girls are what all women want.In fact, the LV handbags are thought as outstanding and rare art pieces and creativity. Hermes replica designer handbags are regarded as combining utility and exquisite appearance. Carrying a Hermes handbag can be seen as a symbol of status and will also draw you numerous of envious glances from passers-by.It is important to facilitate the recycling of old bags, to create a brand new one. You should use the designer and manufacturer! This bag must be right you. For more that may be manufactured by you, mid-air of great style and design, you're sure to certainly be a genius person through the perspective of several people. Its great reputation carries a directly influence within the quick sales of replica Gucci handbags. We all believe which the masterpieces come from top designers are perfect in styles. Gucci imitation handbags are manufactured determined by every detail of the original ones. Simply pay hardly any money then you're able to feel the distinctive design and luxury. Hermes Birkin Bag replica and Hermes Kelly Bag include the most classic types of Hermes. It really is must worth buying any kind of them. As the most prestigious brands on earth, Gucci handbags are very well received inside the luxury market. After having a long development, now they have expanded its business to different product lines like fragrance, apparel, accessories and so forth. All of the success may be ascribed to its perseverance and tenacity. Faced great pressure, Gucci still continually comes with marvelous creations.In world, it is extremely easy for you to get delicate replicas. Searching for-line or buying these fine "knockoffs" in several stores and outlets are common available. In these stores, you can gain these replicas at reasonable prices and are also of high quality. They are the perfect goods for persons who cannot afford the authentic fashion replica Chanel wallets and handbags.Say You cherish fashion bags. They are happy with the modern version available after you buy on the market. You should not wait to buy it. Once home, you will find some of the old bags aren't pretty. Therefore you attempt to throw 2 or 3 advisors, since you are in possession of a replacement.